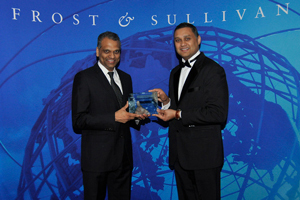 The Frost & Sullivan Customer Value Leadership Award is presented each year to the company that has demonstrated excellence in implementing strategies that proactively create value for customers. It recognizes the company’s inordinate focus on enhancing the value that its customers receive, beyond simply good customer service, leading to improved customer retention and ultimately customer base expansion. Frost & Sullivan does not accept solicitations or applications for this award, instead basing its decisions on extensive private market research and confidential interviews with end users. Opera Solutions is proud to be the recipient of the 2013 Customer Value Leadership Award for Global Big Data Analytics. This prestigious recognition was awarded on the heels of Opera Solutions taking first place in the Personalize Expedia Hotel Searches contest, hosted by Kaggle, besting more than 300 of the world’s most accomplished data scientists.